Around 1500 b.C., Celtic tribes settled in the area of nowadays Switzerland: the Raetians lived in the eastern regions, while the west was occupied by the Helvetii. In 58 b.C., the Helvetii tried to evade migratory pressure from Germanic tribes by moving into Gaul, but were defeated at Bibracte by Julius Caesar's armies and then sent back. The alpine region became integrated into the Roman empire and was extensively romanized in the course of the following centuries . The center of Roman administration was at Aventicum (Avenches). Invaded (5th cent. a.D.) by the Alemanni and by the Burgundii, the area passed to the Franks in 534. Divided (9th cent.) between Swabia and Transjurane Burgundy, it was united (1033) under the Holy Roman Empire. The expanding feudal houses, notably Zähringen and Kyburg, were supplanted (13th cent.) by the houses of Hapsburg and of Savoy. Hapsburg encroachments on the privileges of the three mountainous localities of Uri, Schwyz, and Unterwalden resulted in the conclusion (1291) of a defensive league among them. The legendary hero of this event is William Tell. The league triumphed at Morgarten (1315) and, joined by Lucerne, Zürich, Zug, Glarus, and Bern, decisively defeated the Hapsburgs at Sempach (1386) and Näfels (1388). In the 15th cent. the Swiss league rose to the first rank as a military power. The conquest of Aargau, Thurgau, and the valleys of Ticino, which were ruled as subject territories until 1798, was followed by Swiss victories over Charles the Bold of Burgundy (1476–77) and over Emperor Maximilian I, who in 1499 granted Switzerland virtual independence. By 1513, the admission to the confederation of Fribourg, Solothurn, Basel, Schaffhausen, and Appenzell had raised the number of cantons to 13, and this number was maintained until 1798. The conquest by Bern of Vaud from Savoy (1536), and close alliances with the Grisons, Geneva, St. Gall, and other towns and regions, further increased the Swiss orbit, but Switzerland’s importance as a European power was broken in 1515 when the French defeated the Swiss at Marignano. A "perpetual alliance" with France (1516) and neutrality became the basis of Swiss policy. Swiss mercenaries, however, continued to serve abroad for three centuries (see Swiss Guards). The cantons, loosely bound by a federal diet and by individual treaties and often torn by internal feuds, were seriously split by the Reformation, preached by Zwingli at Zürich and by Calvin at Geneva. The Catholics, led by the Four Forest Cantons, defeated the Protestants in battle; the Treaty of Kappel (1531) preserved Catholicism in Lucerne, Uri, Schwyz, Unterwalden, Zug, Fribourg, and Solothurn. National unity almost disappeared for more than two centuries, but religious divisions did not prevent the Swiss (except the Grisons) from remaining neutral throughout the Thirty Years War. Switzerland was an island of prosperity when, in 1648, at the end of the war, its formal independence was recognized in the Peace of Westphalia. In the following century and a half, government in many cantons became the exclusive business of a small oligarchy. While Switzerland became insignificant politically in the 18th cent., its wealth steadily increased, and its scientists and writers (von Haller, von Mühler, Pestalozzi, Rousseau) made it an intellectual center. The Swiss oligarchies strongly opposed the French Revolution. Invading French armies established the Helvetic Republic (1798–1803) and in 1799 clashed with Austrian and Russian forces. Napoleon’s Act of Mediation (1803) partially restored the old confederation, and, at the Congress of Vienna, the Pact of Restoration (1815) substantially reestablished the old regime, except that the confirmation of nine new cantons brought the total to its present number. By the Treaty of Paris (1815), Swiss neutrality was guaranteed for all time. A subsequent economic depression, which caused large-scale emigration to North and South America, and generally reactionary rule contributed to widely successful demands for revision of the cantonal constitutions and the rise of the Radical party, which favored greater centralization. Opposition to centralization centered in the Catholic rural cantons, which in 1845 formed the Sonderbund, a defensive alliance. After a brief and almost bloodless civil war (1847) the victorious Radicals transformed the confederation into one federal state under a new constitution adopted in 1848 (and recast in 1874). National unity grew, and much socialist legislation (such as railroad nationalization and social insurance) was enacted. Armed neutrality was maintained throughout World Wars I and II. Switzerland was a member of the League of Nations, and although it has long participated in many activities of the United Nations, it did not become a UN member until 2002 for fear that its neutrality would be compromised. Since 1959 Switzerland has been governed by a four-party center-conservative coalition. In the same year Switzerland became a member of the European Free Trade Association (EFTA), and in 1972 it signed an industrial free-trade agreement with the European Community (EC; since 1993 the European Union). In the 1950s, French-speaking inhabitants of the Jura region of Bern canton unsuccessfully demanded, with some violence, the creation of a Jura canton. In 1977 a constitution was accepted, and in 1979 it officially became the twenty-third canton of the Swiss Confederation. In 1971, after a referendum was passed by male voters, women were given the right to vote and be elected at the federal level; subsequently, Elisabeth Kopp of the Radical Democratic party became the first woman government minister (1984–88). In a 1986 plebiscite, a parliamentary proposal to join the United Nations was rejected by Swiss voters. In 1992, Swiss voters also rejected participation in the European Economic Area, an EFTA-EC common market, but did approve joining the World Bank and International Monetary Fund. The rejection of the European Economic Area led to negotiations that resulted in a package of accords that established closer economic links with the European Union; voters approved the agreements in 2000. In Mar., 2002, Swiss voters approved joining the United Nations, becoming the one of the last nations to seek membership in that organization (only Vatican City is not a member). The ubiquitous acceptance of legal tender in payment (banknotes and coins) has so long been a matter of course that it is difficult for us to imagine this once not being the case. And yet, prior to the Monetary Reform in 1850, utter currency chaos had been the order of the day for several centuries in Switzerland. During this time, numerous ruling bodies (e.g. cantons, municipalities, abbeys, etc.) simultaneously exercised their prerogative of minting huge quantities of coins in differing denominations, currencies and coinage systems. Moreover, a considerable influx of foreign coins originating from the wages of mercenaries as well as the first banknotes issued by private banks were also in circulation – a state of affairs which obviously rendered everyday monetary transactions exceedingly troublesome and complicated. In order to put an end to this pandemonium, the Swiss Federal Constitution of 1848 stipulated the transfer of all minting rights to the Federal Government. As a logical extension, on 7th May 1850 the Federal Assembly passed the first Federal Coinage Act, which was closely modelled on the French standard. With this legislation, a uniform silver standard with the 'franc' as monetary unit was introduced in Switzerland. As Swiss minting facilities were inadequate at the time, the very first Federal coins were minted in Paris and Strasbourg. In the year 1853, the Federal Government took over the former mint of the Canton of Bern on a trial basis. The old Bernese mint was renamed the Federal Mint and, from 1890, became an official Federal institution. Nevertheless, foreign coins continued to have a controlling influence on Swiss currency circulation. Although the Monetary Reform of 1850/52 was instrumental in replacing the multitude of old Swiss coinage, this did not primarily foresee nationalising the entire volume of money in circulation. At that time, some 80% of the money supply in Switzerland consisted of foreign currency. Of the high-quality silver coins in circulation, only a negligible percentage was of Swiss origin. The majority of this currency was French or Italian. Insofar as the silver coinage minted in France, Italy and Belgium conformed to the new Swiss standard, these were considered legal tender. At the same time, however, the newly issued Swiss coins were also circulated in these respective countries. In the year 1865, ministers of France, Belgium, Italy and Switzerland signed a monetary treaty (the so-called Latin Monetary Union), which - apart from containing specific regulations pertaining to the weight, fineness, shape and exchange rate of gold and silver coins - also stipulated that the individual governments were only permitted to issue a fixed value of money per capita of population. It was agreed that these identically minted gold and silver coins would circulate freely within the territories of the union. In 1866, the Swiss Government declared that, 'The Federal Council regards the parity of the silver coinage originating from these four countries as a first step towards implementing the notion of a universal monetary system.' The Latin Monetary Union, of which Greece subsequently became another member, remained officially in force until 1926. From this year onwards, the legal tender of our country has been exclusively the Swiss franc. Today, the introduction of the Euro marks a renewed venture towards establishing a common European single-currency area - this time, however, without the participation of Switzerland. Until 1936, gold coins were also circulated in Switzerland. Whereas initially these were exclusively coins from the member states of the Latin Monetary Union, in 1883, the first Swiss gold coins featuring the head of Libertas were put into circulation as well. This was a reaction to a rebuke from France, whereby Switzerland was justifiably accused of 'coinage parasitism'. As the gold rate was roughly equivalent to the face value of these coins, minting and issuing such coinage was unprofitable, and it was for this reason that Switzerland had refrained from producing its own gold coins for many years. The best-known Swiss gold coin is without doubt the 'Vreneli', which was issued for the first time in 1897. With the devaluation of the Swiss franc during the Great Depression in 1936, the metal value of gold coins - of which, at that point, only locally minted coinage was circulated in Switzerland - suddenly exceeded their face value, thereby causing this currency to lose its status as legal tender virtually overnight. In the 1950s, gold coins were once again minted for circulation. Owing to monetary policy and the mounting price of gold, however, these coins were never issued and are now part of the Swiss National Bank's gold reserves. 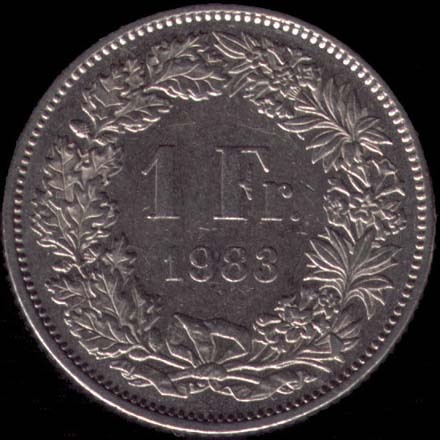 The discontinuation of minting silver circulation coins in the year 1967 marked the end of a time-honoured tradition in Switzerland. As a result of sharply rising silver prices, the metal value of 2 ,1 and ½-franc coins exceeded their respective face value. These circumstances in turn led to large quantities of coins being transferred abroad for the unauthorised purpose of melting them down for silver bullion. In order to counteract this misuse of circulation coinage, the Federal Council prohibited the export of silver coins and furthermore decreed that as of 1968 all 5, 2, 1 and ½-franc coins would no longer be minted in silver, but in a copper-nickel alloy composition. With this ruling, all denominations of Swiss coinage were effectively disconnected from the prevailing metal values.